Speaking at the Global Education and Skills Forum in Dubai this week, Mr Blair discussed how education should respond to last month's attacks on mosques in New Zealand, in which 50 people died. Mr Blair told the international education conference that extremism had to be tackled from an international perspective, rather than in terms of individual countries. 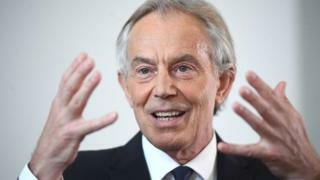 "What happens within a country's borders is not just that country's business," said Mr Blair. He called for education systems to actively promote a "tolerant view of the world". "All countries have to do this because everyone has got problems - there is Islamist extremism, right-wing hate speech, anti-Semitism, Islamophobia." Challenging prejudice needed to begin at an early age, he argued. "It's often when children are at their youngest that they need to be given this awareness of the way the world is - and helped to think in a way that is open minded from that young age." Mr Blair said many education systems needed "vital reform" because "literally millions" of children were being taught in a way that was narrow and closed. He said ducation should be seen as a "security issue" and urged governments to use a greater share of counter-extremism expenditure to "invest in the future of our education systems and our young people". According to the US-based think tank, the Stimson Centre, the US has spent at least $2.8trn (£2.1trn) on counter-terrorism efforts since the 9/11 attacks on the US in 2001. But programmes to prevent violent extremism, including through education, make up only 0.1% of global spending on counter-terrorism, according to the Centre for Strategic and International Studies, also based in the US. Mr Blair emphasised that investing in education to prevent extremism should be a priority. "You've got to deal with the ideology of extremism and not just the consequences," he said. Teaching young people about tolerance and tackling prejudices was the "only way" to ensure the next generation will be "free of the ideology of extremism", he said. He called for schools to teach young people about critical thinking to equip them with the skills to challenge prejudice. "Children need to be able to think critically and part of thinking critically is being open to others," he said, speaking at the education conference run by the Varkey Foundation. An international approach would help governments in countries which "face resistance from small-c conservative elements within their system", he said. "If I was back in government today, I would be trying to do what we've done with the environment and climate change." Tackling extremism and promoting respect for different views should be seen as a "global obligation", he said.